Technological change is moving at lightning speed and continues to affect how we do things – from hailing taxis to ordering groceries. And it’s showing no signs of slowing down. The tech being used to create the environment for films such as Man Of Steel or the latest Star Wars is stunning. This part of the production process is called ‘world building’ and it’s a lot more than simply building a stage set and finding some props. It’s about creating a world, often using VR rather than the storyboard drawings of old, inside which the film’s narrative can play out. Often the ‘world’ – particularly in sci-fi – becomes a character in its own right, informing the script and the production process. For example, the film Minority Report had no script for the first year of pre-production. So the gesture control used by Tom Cruise to locate crimes before they happen and the cars that travel up and down buildings, and other script points, were informed by the “fabric of the world” rather than by a pre-written script. At a conference in Copenhagen last week called Picture This 2017, film practitioners were joined by the world’s most pervasive game engine designer, Unity Technologies. It was there to discuss how games technology is taking storytelling in new and exciting directions. Unity software powers 38% of the world’s mobile games, including Pokémon Go. In the past year, Unity-powered games have had 15 billion app installs and its software works on some 30 platforms, from PlayStation to Gear VR headsets. 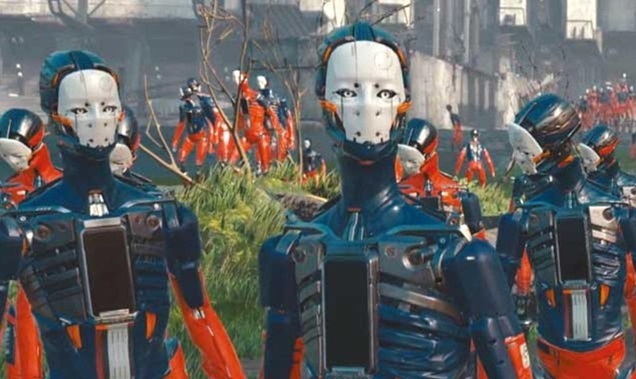 Now Unity has produced its first sevenminute film, from inside its game engine software. The film, called Adam, is about a robotlike creature that is released from a penal colony. The story of Adam in the film is secondary to the fact that it looks like a film, not a game. The power and fl exibility of the software with real-time rendering is impressive. For example, the film’s director (a software coder by background) decided within a few hours of the film being shipped out of the door to change the camera angles on some scenes. The ability to iterate all the way up to the end of the process is characteristic of the games industry, but not so for film and TV. At least not yet. For cinematographers, probably the most amazing thing about Adam was how the software provided improved shading, motion blur, volumetric lighting, translucency and so on, all of which makes the finished product look less game-like and more filmic. Right now, you need to know how to code to use the software that underlies Adam, but a version for non-coders is imminent, says Unity. Remember when digital music launched and we all threw away our vinyl? Digital cinematography was also lauded for doing away with any artefacts. Interestingly, artefacts aren’t always so bad when chosen for aesthetic reasons.